For one of the better homemade granola bar recipes out there—with no added sugar whatsoever—these Date, Coconut, and Peanut Granola Bars are naturally sweetened, easy to make, and the best snack choice for kids and adults alike! Using dates and Manuka honey for sweeteners and cinnamon, ginger and coconut for a unique flavor blend, these granola bars offer a delicious fudge-like texture that prevents any mess, and they also use oats and peanuts to provide slow release energy, aimed at keeping the granola consumer going for hours at a time without having to stop. 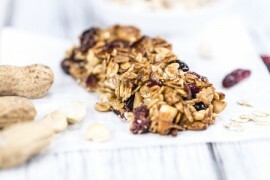 Creating 16 bars in one baking session, these granola bars will likely become a new favorite to anyone who eats them, so it is likely safe to get in the habit of making them as often as you can. Now, let’s get started! From start to finish: 40 minutes. Servings: 16. Nutritional information per serving: 200 calories; 107 calories from fat; 12g fat (7g saturated; 0g trans fats); 15mg cholesterol; 11mg sodium; 23g carbohydrates; 2g fiber; 13g sugar; 3g protein. Grease and line an 8-inch square baking pan and preheat the oven to 325 degrees. Add the unsalted butter, pitted and chopped dates, Manuka honey, coconut, ginger, and cinnamon to a deep saucepan and heat over a low flame until butter and Manuka honey melt. Stir occasionally. Stir in the oats and chopped peanuts until mixed well, then spread evenly into the baking pan. Pat the top down with a spoon to smooth the top and drizzle the top with extra Manuka honey. Bake for 25 to 30 minutes or until brown and firm on top. Allow to cool before cutting granola into squares. These bars will keep for up to one week in an airtight tin or Tupperware container. Serve at your discretion and enjoy!